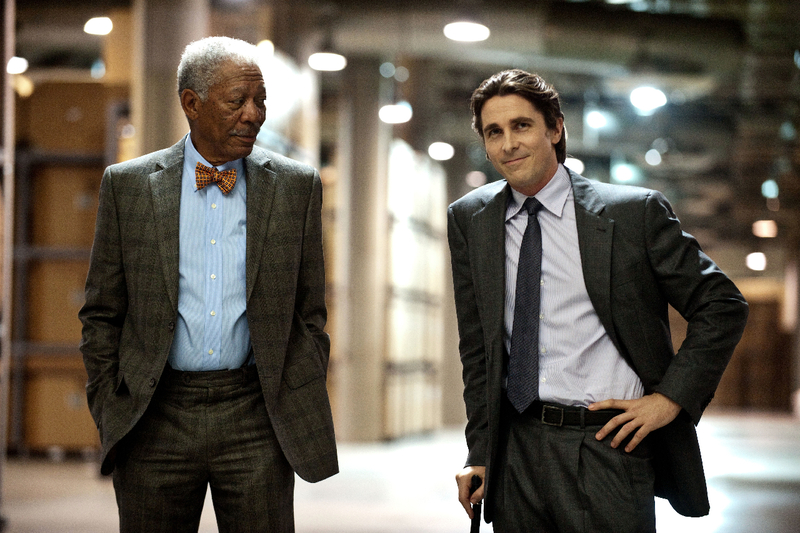 Upon reflection, I realised that ‘The Dark Knight Rises’ isn’t much more than mediocre. It’s little more than a multiplex pandering, noisy summer blockbuster that hides behind a veil of overly dark and ‘serious’ themes in a really rather pretentious manner. Much like its predecessor, the film is convoluted; its simple plot is dragged over 165 minutes. I actually didn’t find the length particularly bothering, I don’t think I started to fidget too much in my seat, but I was certainly aware that it was too long. Predictably, the film is overrated, much like fellow blockbusters ‘Avatar’, ‘The Dark Knight’ and ‘Inception’. All of them adopt the generic blockbuster formula, one of the signature elements of this formula being the humdrum orchestral score, which either sounds like an approaching ocean liner or is so flat and featureless that you’ll leave the cinema forgetting it had one. Christopher Nolan loves his epic narratives to be full of twists and turns, and he will create them no matter how implausible they are. ‘Rises’ isn’t at the top of the implausibility scale, I think that area is reserved for ‘Inception’ or ‘The Prestige’, but so many parts of this film are tiringly unlikely and badly executed. I’m not a fan of literal film criticism, however Bruce Wayne transforms from a decrepit, gout ridden Howard Hughes figure to crime-fighting Batman within an hour, as if the rather damning diagnosis given at the beginning of the film was false. I think they were trying to cram in too many elements of its source material into the bloated plot in a ‘Spider Man 3’ fashion. Without spoiling anything, the ending is also a weak point; its sheer theatrical unlikelihood saps any power or catharsis it intended to be dripping in. The careless implausibility is to be found throughout the film, and for me, it detracted significantly from my engagement with the film. The film is striking, yes, but not as striking as you’d expect. The word ‘epic’ is being thrown around constantly about this film, but it’s rather ordinary; it’s decent, but it doesn’t stand out like ‘Avatar’. I must admit I found the opening of ‘2012’ more exhilarating. Contrary to a rather sizeable opinion, I quite liked Bane. I liked his brutal strength and even his voice, which was only slightly irritating after the lengthy monologue delivered upon the car to the inmates. Christian Bale’s performance was again quite unremarkable, like everything with the film – it was okay, nothing special. I like Bale a lot, it’s not entirely his fault, it’s the fault of the character’s. Bruce Wayne and Batman aren’t the deepest, most multi-faceted of characters; Bale is either the restrained, non-entity of Wayne or the growling Batman. The best performance is Michael Caine’s, who has one particular scene that’s given with a marked sincerity that is a real showcase of Caine’s talents. Ultimately, I left the cinema feeling quite hollow. It wasn’t all bad, but it was rather uninteresting, slightly stupid blockbuster fare.